Tourist Information Centre Walk 21 at Great Yarmouth Promenade Starter01493 846346work Walking RouteThe Great Yarmouth Promenade Starter Walk is a 4 mile (6.4 kilometre) circular walk starting at the northern end of the seafront where North Drive meets Salisbury Road and is a gentle walk suitable for all levels of ability. From the natural sand dunes at North Denes where the Little Terns migrate to each year this walk will then take you past the visitor entertainments on the Golden Mile to the industrial southern end towards the harbour. This walk can be made into a shorter Linear walk by catching the Road Train back along the seafront. Public facilities are available in several locations along the main seafront promenade area along with a vast choice of places to stop for some refreshments along the way. 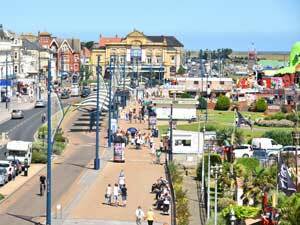 The Great Yarmouth Promenade Starter Walk is a 4 mile (6.4 kilometre) circular walk starting at the northern end of the seafront where North Drive meets Salisbury Road and is a gentle walk suitable for all levels of ability.